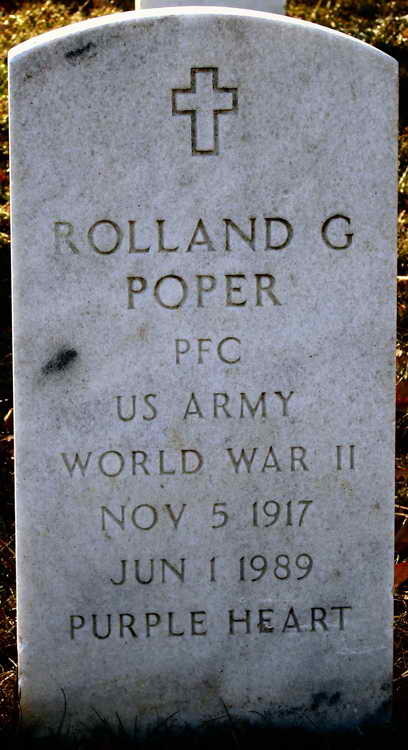 Grave marker for Rolland G. Poper in Section 30 Site 1073-LH of Arlington National Cemetery, Arlington (Arlington county), Virginia. Rolland enlisted in the Army at Toledo, OH on 10 November 1942. As a member of Company B, Pfc Poper jumped into Normandy on D-Day, 6 June 120944. He was taken prisoner that same day. He was released from Stalag 13b a year later.